Each purchase includes 1 set of VistosoHome Stainless Steel Wine Glasses. The set includes 2 stainless steel wine glasses with powder-paint coating, 2 plastic lids with air-hole and silicone rubber seal, 2 stainless steel straws that fits within the lid. The stainless steel glasses are dishwasher safe BUT dishwashers have been known to deteriorate the connection between the rubber protective pad and the bottom of the steel cups. For long lasting use we recommend hand washing these glasses with soap and warm water to make sure they last longer and the rubber protective pad stays on for the lifetime of your mug use. If the rubber does so happen to come off, the glasses will still function perfectly fine! We hope you enjoy the VistosoHome 2-Pack of Stainless Steel Wine Glasses! The cups are the perfect gift or addition to any camping trips or for drinks in the backyard near the pool. They were built to be durable and long lasting and perform exceptionally well to keep drinks cold while in warm weather and environments. Enjoy your favorite wine, soda, cocktail or other beverage in these glasses and be sure to keep every sip as cold as the first! PORTABLE: These stainless steel wine glass tumblers are the perfect travel or camping cup! Featuring a plastic lid with silicone rubber seal and a stainless steel straw, they are the perfect wine glass for camping, the pool, picnics, the beach, backyard and vacations. With a convenient 2 pack you'll always be prepared for you and a friend. KEEP YOUR WINE COLD! : This 2-pack of stainless steel wine glasses is made from double-walled 304 grade stainless steel. This material allows your drink to stay colder for a longer period of time and it won't sweat or drip on your hands. The stainless steel is easy to clean and the stemless design is great for travel and packing in cars or bags. 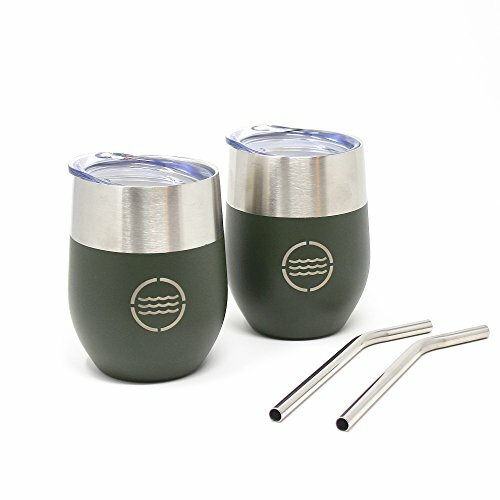 EXTRA FEATURES: Unlike most stainless steel mugs on the market, with this set you will receive 2 stainless steel double-walled wine glasses with tough powder coating, 2 plastic lids for drinking with air-hole and silicone rubber seal to prevent spills & 2 stainless steel straws that fit perfectly within the lid for easy drinking on the go! The mugs also have a rubber pad on the bottom of the cup to protect it against hard surfaces and also to protect your tables, counters and more! PERFECT GIFT: These mugs make the perfect gift for a friend or family member who enjoys an ice-cold drink and also enjoys high-quality durable products! They hold 12oz of your favorite beverage and look great no matter where you choose to enjoy them. With the extra included lids and straws, these stainless steel wine tumblers are sure to make your gift one to be remembered. LIFETIME WARRANTY: VistosoHome products are designed and manufactured with top of the line materials. We stand behind our products 100% to keep our customers satisfied. If you have any issues, just contact our customer service team and we will solve your issue or refund your purchase. If you have any questions about this product by VistosoHome, contact us by completing and submitting the form below. If you are looking for a specif part number, please include it with your message.